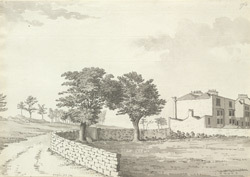 A view in ink of Mrs Rossignol's house in Sion Row, Clifton. It is uncertain who Mrs Rossignol was. She may have been an acquaintance of Grimm's patron, the Rev. Bart.